Updated for Sunshine Week 2012. An oldie but a goodie. I wonder if President Obama is beginning to feel a bit like Dr. Kissinger. At any rate, a “meta-tribute” to the power of FOIA. He then explained how he would facilitate the illegal circumvention of a Congressional arms embargo. This bombshell of a quote (even for Kissinger) comes midway through his conversation with Turkish Foreign Minister Melih Esenbel. The vast majority of the fifty-minute conversation –held in Turkey at the Foreign Minister’s office– focused on the FM’s displeasure with the US Congress’s decision to pass an arms embargo against Turkey’s 1974 invasion of Cyprus. Esenbel explained that the prevailing mood in Turkey was that one NATO ally should not enact a military embargo upon another. He even stated that the US embargo could endanger his party’s government, explaining the he, not Kissinger or the US Congress was being criticized for the lack of aid. One: Get Congress to change the law. Two: Use a military “waiver.” A loophole that allowed “spare parts” to be provided for one year. 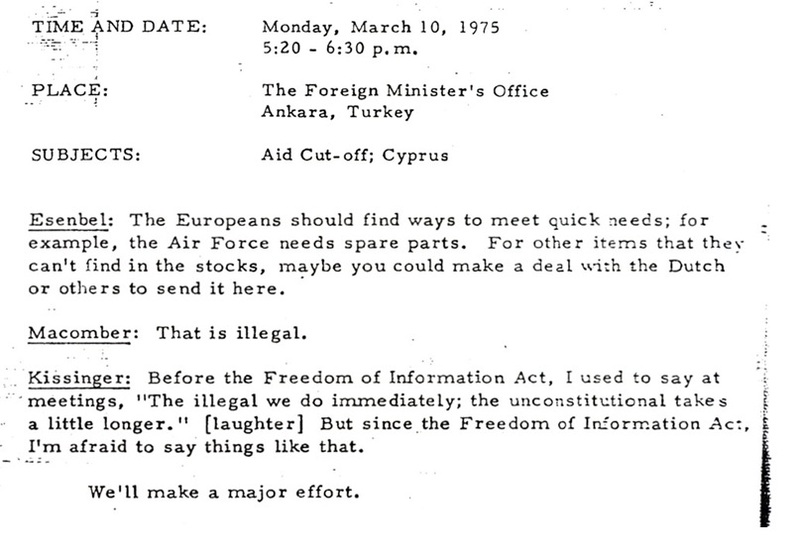 The “illegal” action Kissinger referred to was Esenbel’s suggestion that the United States “make a deal” with European countries to sneak US goods to Turkey despite the embargo. ← DOJ OIP Director Pustay testifies that “people misinterpreted,” “misconstrued,” “didn’t necessarily understand,” FOIA regulations allowing DOJ to lie to requesters. Issa report gives DOJ a “D” on FOIA. This is one of my favorite documents ever…long live the FOIA! Thanks for posting. Good site from what I have seen. Thanks for bringing light.